Cat lovers, rejoice; there is now a film out there where an adorable little kitten stars in a film where the violence is about on par with a Tarantino film! American comedy duo Keegan-Michael Key and Jordan Peele – better known as Key and Peele – are behind this momentous breakthrough in cat cinema, named Keanu after the given name to the central cat, which is an entertaining and often hilarious send-up of gangster movies and, more specifically, the racial politics that come with certain criminal archetypes. It sees said kitten being adopted by Rell (Peele), who has just gone through a rough break-up and suddenly finds his life has purpose again when little Keanu literally shows up on his doorstep. 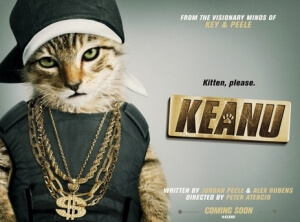 However, when Rell comes home to find that Keanu has been taken by a group of dangerous drug runners, he and his straight-laced cousin Clarence (Key) must adopt toughened personas that contrast greatly with their normal personalities in order to infiltrate the gang and get their beloved kitten back. Key and Peele are already household names in the States, with even Barack Obama citing them as comedy favourites, but not so much on our UK shores which doesn’t bode well for this film’s longevity over here; and honestly, that’s a real shame, because there’s a lot about this movie that’s not just incredibly fun to watch, but also hits certain comedic spots that not a lot of mainstream comedies, even adult-orientated ones similar to this, even think about hitting. One of the main jokes of the film, aside from all this violent stuff happening with bodies being shot at left and right due to the unavoidable cuteness of a little kitten, is that Key and Peele’s characters are originally rather mellow with a hint of, erm, whiteness about them; they listen to George Michael as they’re driving, they go and see Liam Neeson movies, posters for films like Edge of Tomorrow and Cloud Atlas hang on their walls, etc. It’s only when they start to infiltrate the drug runners in order to get little Keanu back that they begin to take on personas that society has accepted black gangsters to have, and they’re surprisingly good at it. Some may view this as a mere reinforcement of certain racial stereotypes, but really it’s clearly satirising that perspective and playing it up heavily for laughs; of course, not every black person slips the n-word into everyday conversation, nor are they trigger-happy psychopaths like the gangsters depicted in this film, and here they show that in a way that isn’t mean-spirited or unpleasant, but instead they look at the situation and laugh at it. That’s what Key and Peele do best, take real social issues like race, gender, sexuality and other hot topics, and use them to their comedic advantage while also highlighting them through laughter, and with Keanu they once again spare no expense. The film definitely deals most with the racial politics of urban-meets-suburban, but it also never forgets to be first and foremost a comedy, and it manages to produce a good chunk of laughs that work with or without the core subtext. Key and Peele are great together and share a clear on-screen chemistry that makes it easy to see why their show on Comedy Central took off the way it did, with Key being especially lively as an uptight stay-at-home dad who is scarily convincing as the sinister gangster he pretends to be. The violence, too, is both surprisingly gory with headshots and dead bodies lying every which way they turn, but when you realise that it’s all surrounding a film based around a cute little kitten, somehow that violence becomes more laugh-out-loud bizarre and humourous, and you honestly don’t mind that there’s a bigger body count here than the last Tarantino film. There is also one major cameo we won’t ruin for you here, mostly because their identity and the person they’re “playing” is part of a bigger punchline that is hilarious when you know who this person is in real life, and also rather terrifying as they become more erratic and psychotic as the scene goes on – without giving anything away, you can clearly tell this person had previous experience in scary movies. In short, Keanu is definitely a comedy that pulls no punches when it comes to satirising gangster movie clichés and racial politics, all the while remaining the kind of entertaining and incredibly funny comedy that only Key and Peele could deliver. And yes, that kitten a-goddamn-dorable. Keanu sees comedy duo Key and Peele tackle racial politics and gangster movie clichés in this highly entertaining and often very funny send-up that puts them in good stead as comedic writers and cat lovers.